Fit for a little princess! JerzDiva created this precious diaper cake for her cousin - and it is amazing! Love the crown, love the colors, love the design, love the cake! JerzDiva has made a wonderful addition to our diaper cake gallery - and she has given the rest of us some darling ideas for our own diaper cakes! 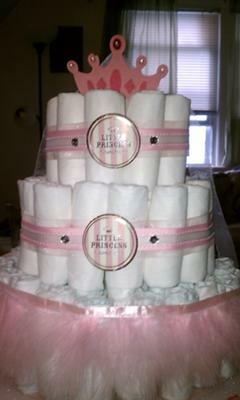 Thank you so much for sharing your gorgeous princess diaper cake, JerzDiva! Share your diaper cake ideas right here! We'd love to add them to our photo gallery. 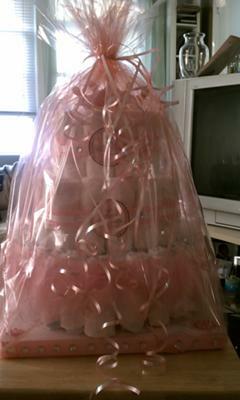 This is a diaper cake that I made for my cousin. It was a princess theme!!!! I used a 12x12 styrofoam base ($3.99-AC Moore) and I wrapped the edges in ribbon and used crystals in the front. The crystals and ribbon I already had! I covered the base with a cardstock circle(AC Moore-$4.99), then i use bamboo toothpicks to make the circle and i roll the diapers and put the diapers on the sticks to make the outer layer. Then once I make the outer layer, I fill the middle with diapers(size 1) The bases takes about 40-50 diapers. I roll the diapers and use clear elastic bands to hold them together. I start the 2nd tier and repeat the same process for the outer layer. 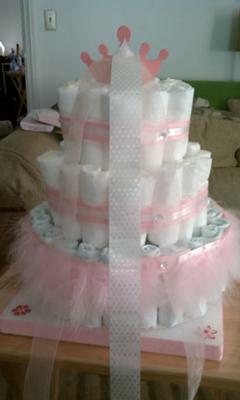 For the top layer, i used about 10-12 diapers and put the ribbon around them and put the diapers on top. Once all the diapers are in place, i cut the ribbon and start to wrap them around the tiers. I use glue dots($3.99-AC Moore) to close the ribbon and added a crystal. I used a feather mini boa($3.99 AC Moore) to wrap around the base. The little princess decorations($1.99 AC Moore) are attached to the top 2 tiers with glue dots. The princess topper is a wooden topper($1.99 AC Moore). The flowers are stickers($1.00 AC Moore). The total amount of diapers for this cake are 75-90. I look for diapers on sale just about everywhere. I bought a box of 96 diapers from Target for $20.00. This cake is for your daughter which you take for her Birthday. You gave the name of this cake is Princess Diaper Cake because a small shape of princess made in the cake which is looking very nice. I love your selection cake and hope your daughter and other family member like this design cake. I like to say thanks for this great design of cake.